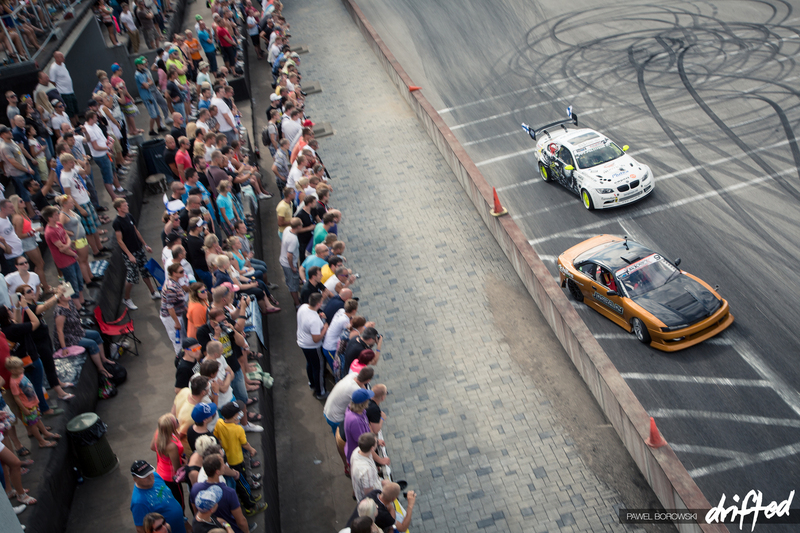 EXTREME Drift Allstars Europe would make its latest debut at the LaitseRallyPark in Estonia. 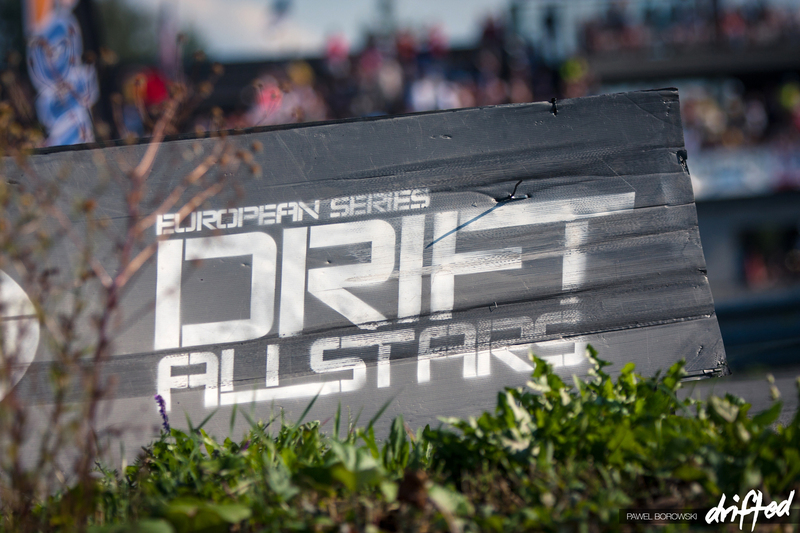 Round five of the series would see all the international teams head north from Riga, Latvia which held the round four event just five days earlier. Lots of teams from western Europe and Scandinavia saw this as an ideal opportunity to take some time off or work on cars in between events. 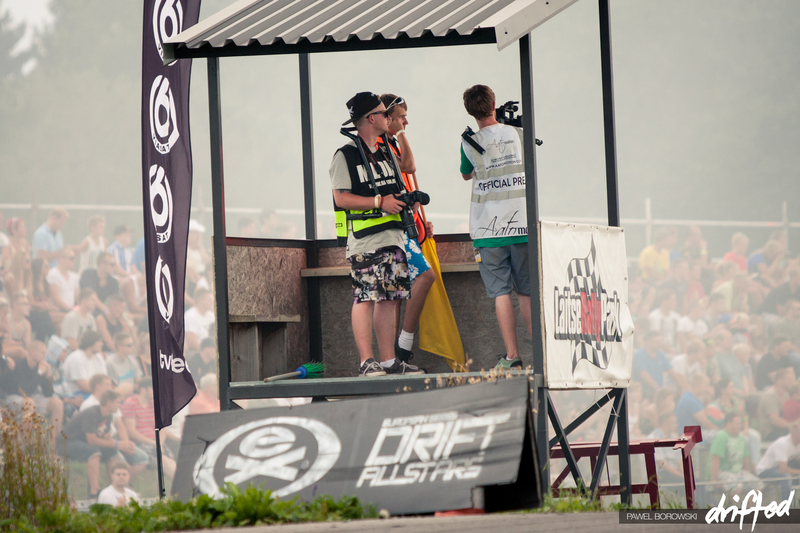 With Estonia being a new stop on the 2014 series, lots of questions would arise prior to the event. The event would be hosted by LaitseRallyPark, a brand new facility less then two years old. With its primary use as a rallycross track and driver experience centre. With each new addition to the calendar brings certain criteria and event hosting regulations from paddock areas, to track sizes, grandstands, and hospitality areas but one of the main criteria is having different bespoke track designs. 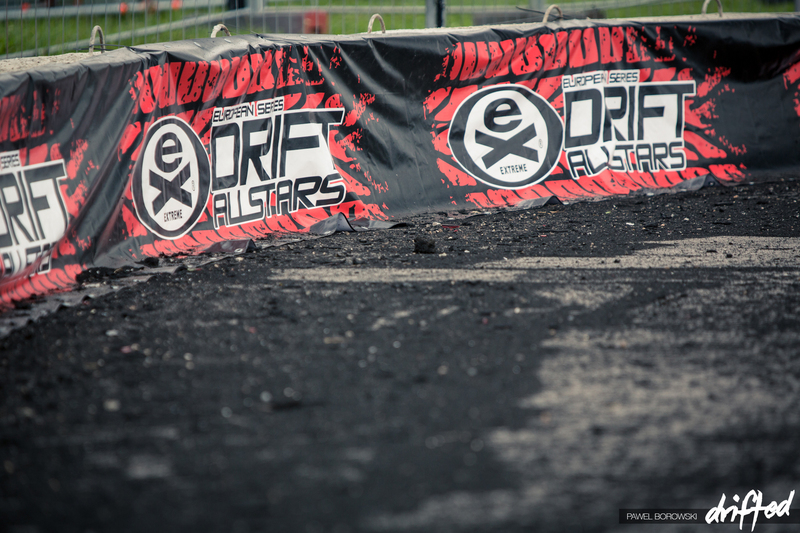 The organisers would go as far as to modify an existing rallycross circuit and actually lay asphalt down to make the complete Drift Allstars Track. With a jump, drops and rises in elevation and lots of walls to rub, the LaitseRallyPark would have it all. 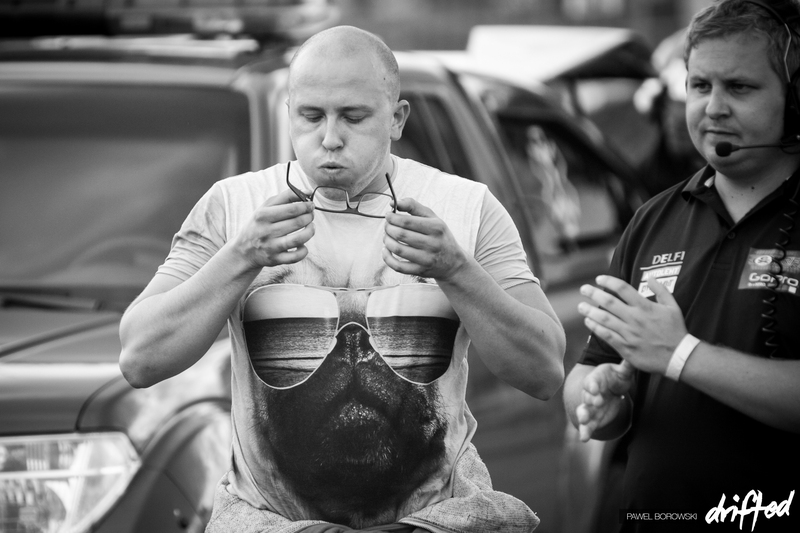 The Polish Budmat Army was in attendance , with round one winner Piotr Wiecek keen to get his championship title chase back in gear. 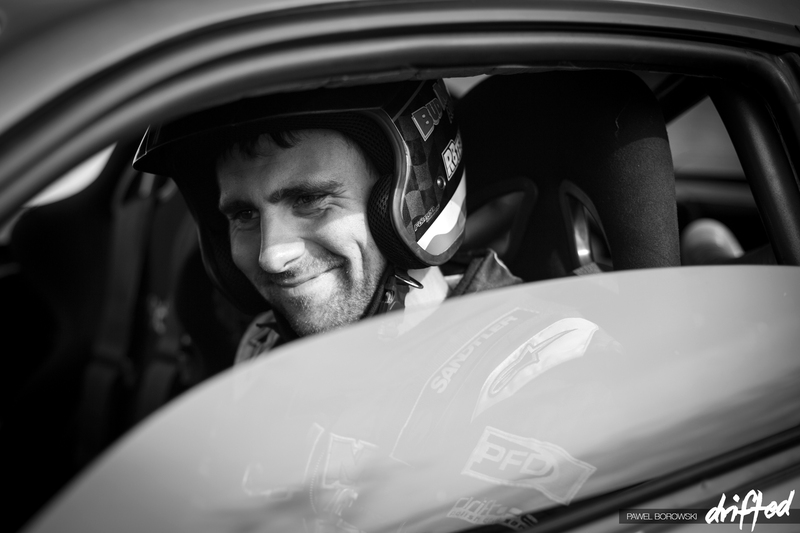 His team mate Karkosik, the winner of the Czech Drift GP, also hungry to improve on his third place in the standings in 2013. 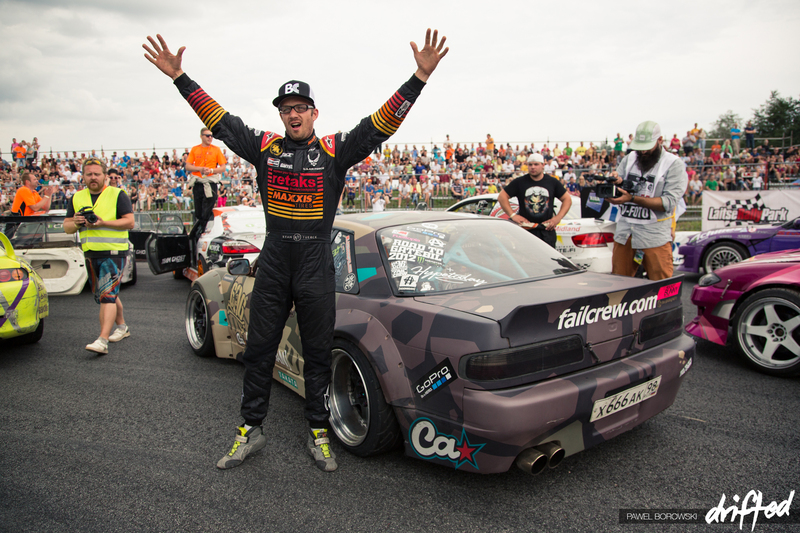 Fail Crew would have a special guest driver this weekend; Ryan Tuerck would be making his second appearance for the now famous #CrazyRussian Fail Crew team. 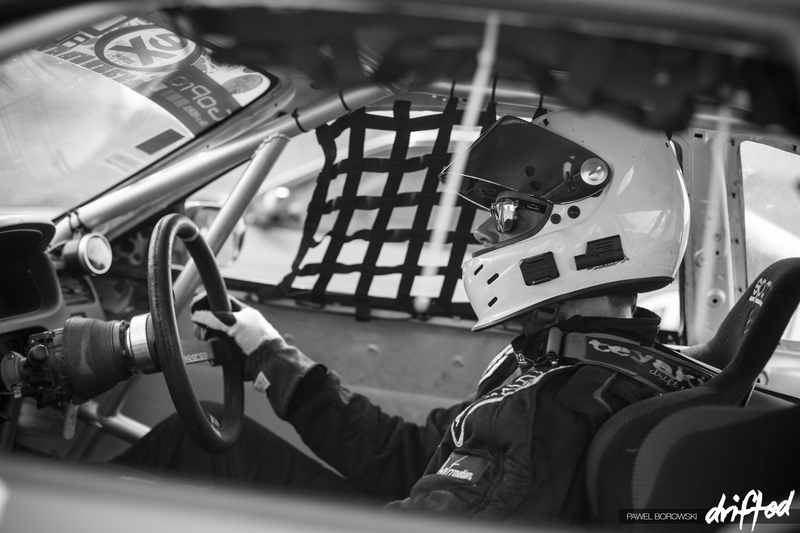 Martin Richards… eyes on the prize. With his third season in the series he is ranked his highest at fourth place. Can he improve on his 2013 result? Martin is always steady scoring points while others have mechanical issues. With Estonia being just a two hour ferry ride from Finland, there was quite a few Fins driving. Juha Poytalaakso was another Fin over to make a point. His M3 Turbo E92 is ridiculously loud, and with nearly 800hp on tap was one of the fastest cars on track, with huge smoke pouring off his car. Elvijs Kezis has been struggling to set up his 750bhp M3 Turbo E46 saloon, but when he gets it dialled in will be a force to be reckoned with. 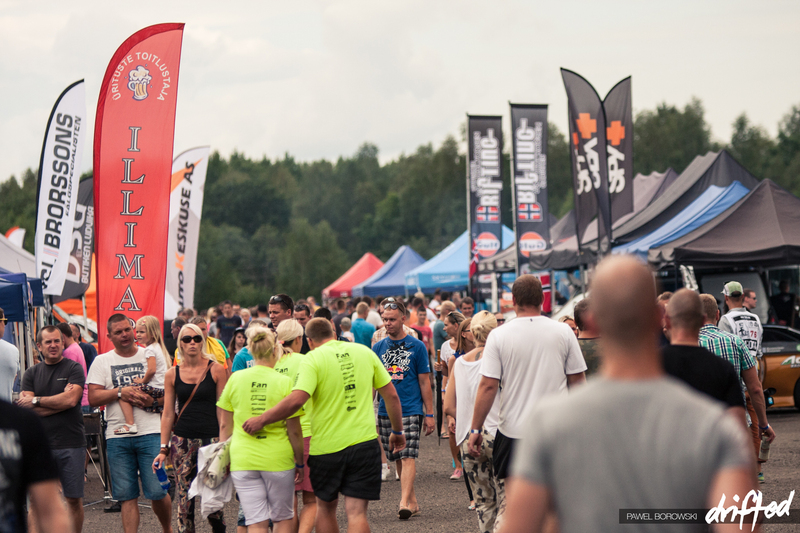 Johan Havarson made the last minute decision to stay in the Baltics after having a good drive in Riga. Could the swedish driver upset the standings? 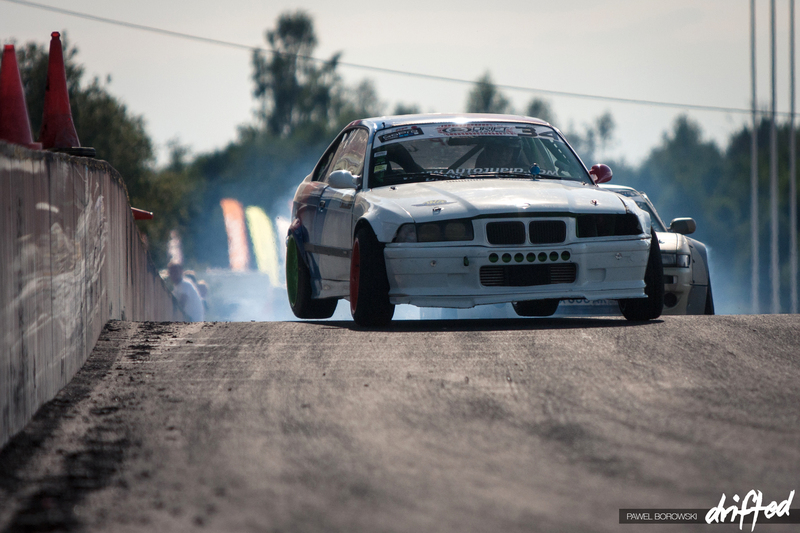 Local Estonian drivers certainly where not afraid of the walls. 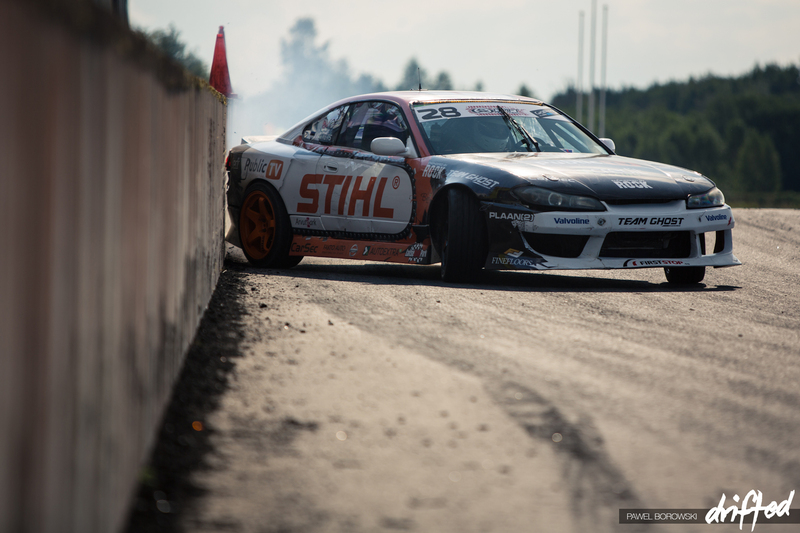 Kristian Klements of Team Ghost Team Stihl in his V8-powered S15 was driving well all weekend. Team Media always working hard. BandanaBoy and Matt Murray of Aatomotion are always ready to capture the madness on film. The LaitseRallyPark would certainly be one of the most challenging circuits, with no room for comfort. Johan Halversen had a great first day practice but on his first qualifying run pushed too hard, ending his weekend. 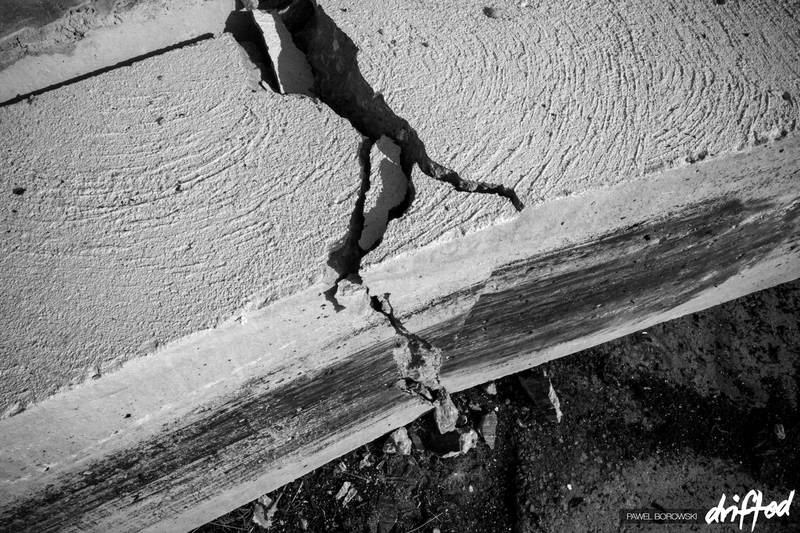 The hits was so hard it broke the concrete wall! 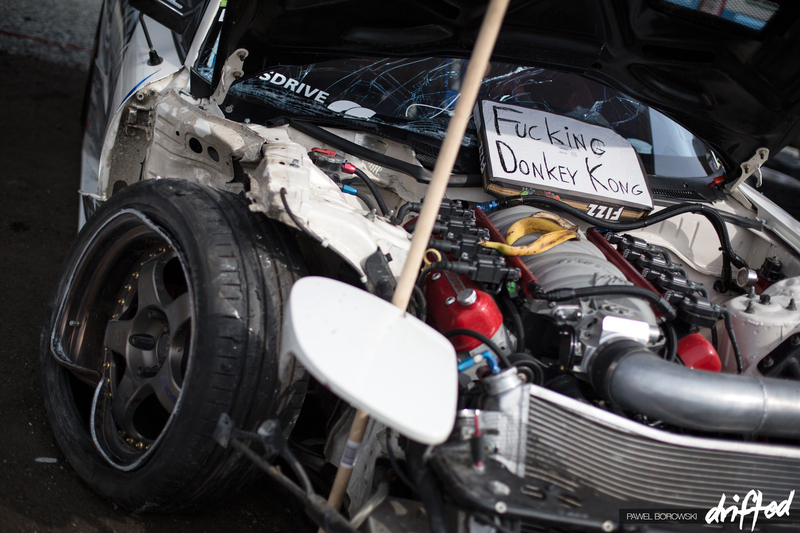 Joachim Waarguaard was blaming Donkey Kong’s Banana Skins on track. Joachim would take a big hit but understands its all part of the game and pushing at the limit. Expect Joachim to return in a big way in 2015. An LS-powered Nissan S15 vs a BMW V8 turbo-powered Mustang. Only in Estonia. Another picture of the jump from practice, wall run on entry and a jump! Ebisu who? Christer Halvorsen would have a great qualifying pace having one of the top runs. When it came to battles he was against Mihkel Norman Tults in his BMW, a quite slow driver in performance compared to the Yokohama S15. This change of pace would put Christer off and end his day. Alot of the drivers were saying that the top 32 battles where often harder to judge due to the huge change in grip between top level cars and low qualifiers. 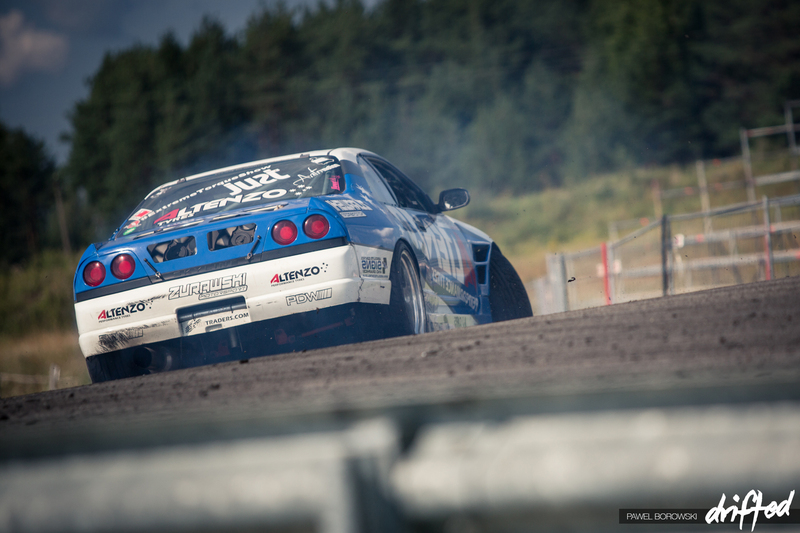 2013 Drift Allstars European Champion Juha Rintanen would face off against fellow countrymen Juha Poytalaakso. Rintanen seemed to struggle with the setup in the borrowed S14 all weekend and Poytalaakso would have just too much forward pace in his 800hp BMW E92 and move through to the Top 16. Elvijs kezis was really getting used to his car but again the wall claimed another driver when he battled Ismail Salaih and just caried way too much speed. Kezis obviously shook from the crash. He’s having a really tough 2014 season. Fail Crew got Wisefab Lock. This would be the first time debut of the Fail Crew PSV8 V2.0 in artic camo and the first time both cars would be in attendance together. With the car just being finished at the HGK workshop in Riga the night before, there was still a few changes to make it 100% so the team decided to run Ryan Tuerck in the Brown V1.0 car instead. 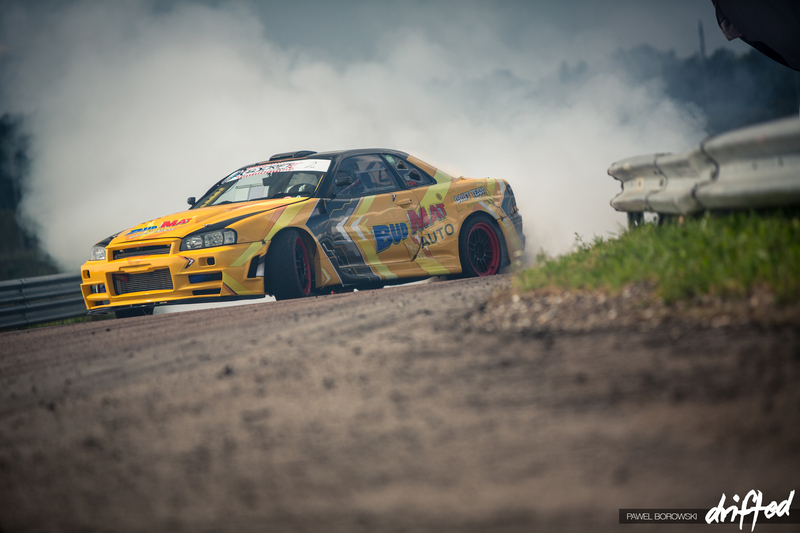 Ryan Tuerck pumped for the top 16 battles after winning his Top 32 battles quite easy. 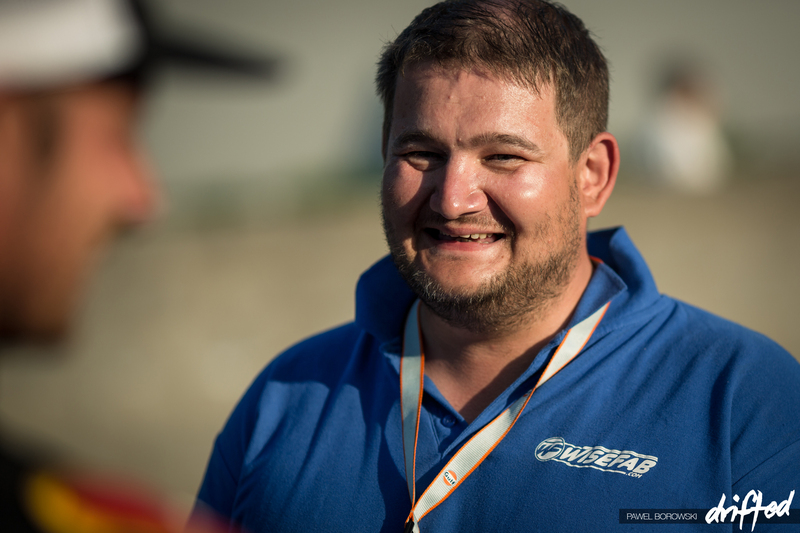 Piotr Wiecek would exit the event early after Janis Eglite would beat him in the Zeetex tires BMW. 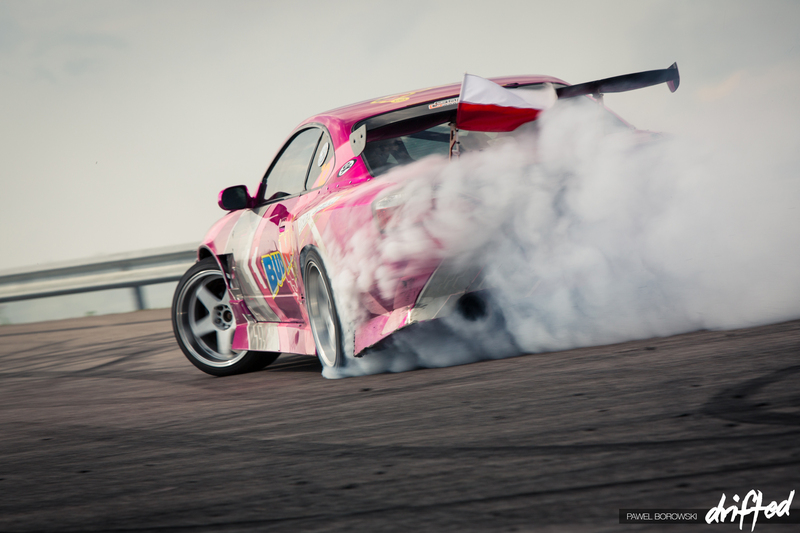 Bartosz Stolarski creating Achilles smoke clouds with his insane 900hp V8 Turbo S14. Even drivers dont mind getting dirty! 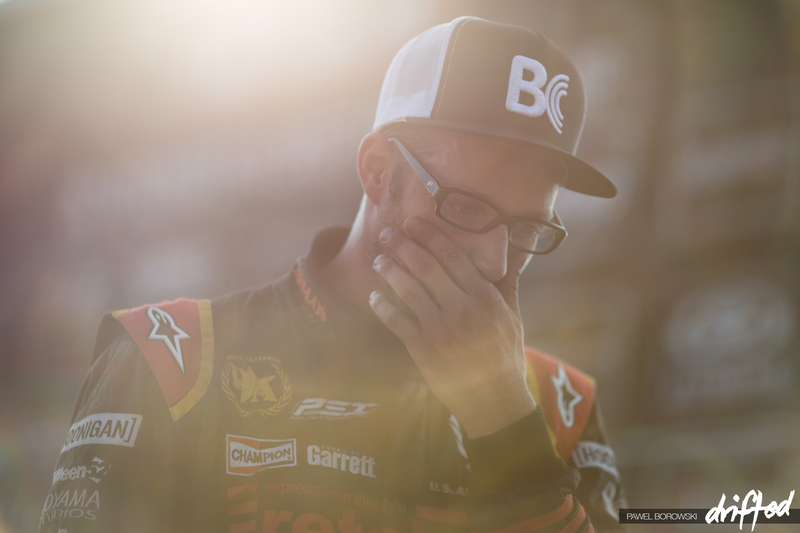 John Shanahan would work tirelessly to help his son Jack in the pits but it would be a DNF after such a strong showing of third place in qualifying. Finnish drivers have a funny way of engine cooling! 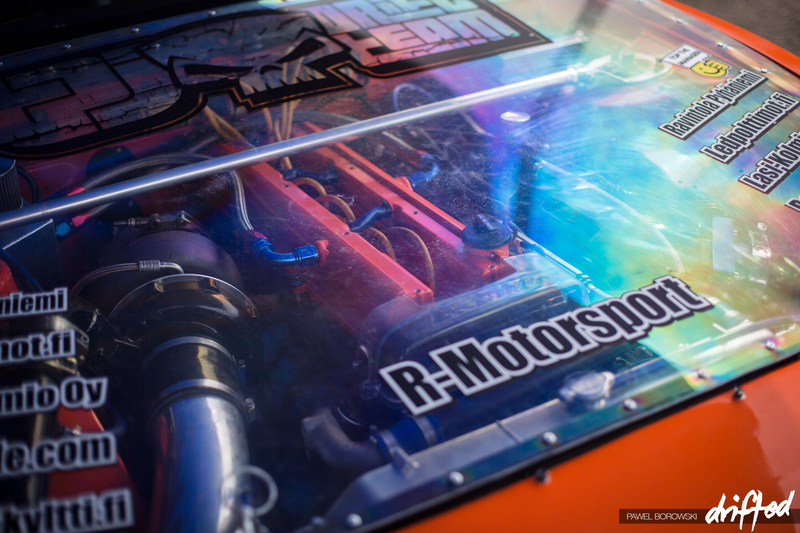 We’re not sure how good this perspex bonnet is for temperatures? 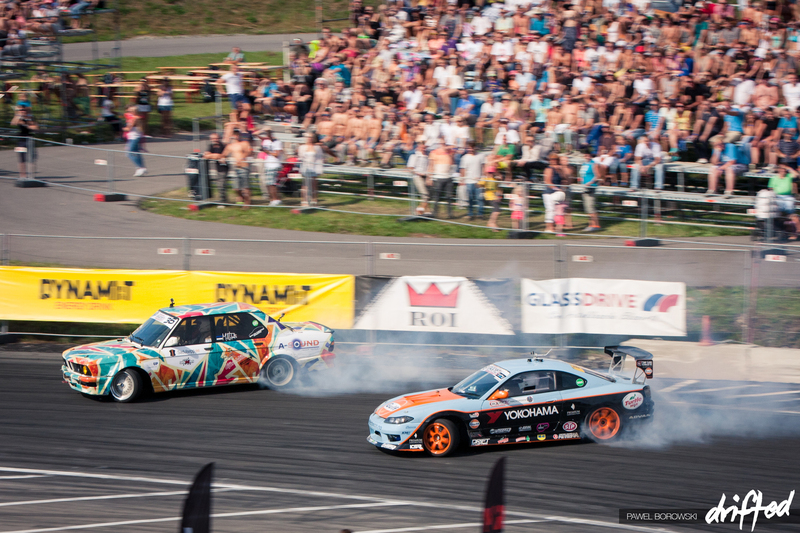 Another battle of the day was the local hero Harold Valdma against Norwegian young gun Fredrik Oksnevad. Both drivers pushed extremely hard but Valdma just had the edge and the confidence on the day to take the win and show his home crowd a result. Dawid Karkosik happy as ever. Could he take his second win of the year? 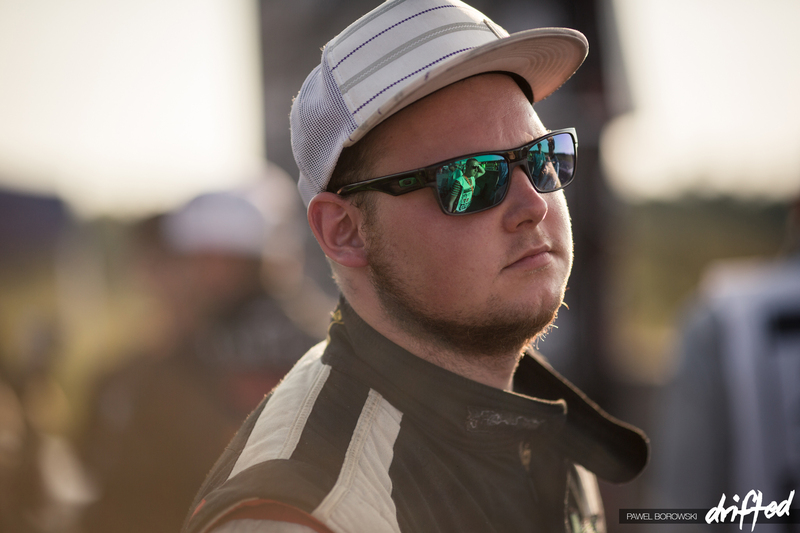 In the Top 16 we would see some giant battles with Polish champ Stolarski against Karkosik, the top ranked Polish driver in Europe last year. Stolarski would again show his experience and move through to the Great 8. One of the battles of the Great 8 was Valdma, having the drive of his life, against another flying Fin Juha Poytalaakso. Both high powered cars – BMW E46 V8 Vs BMW E92 M3 Turbo. It was a very close battle but Valdma had the extra momentum which gave him the win. 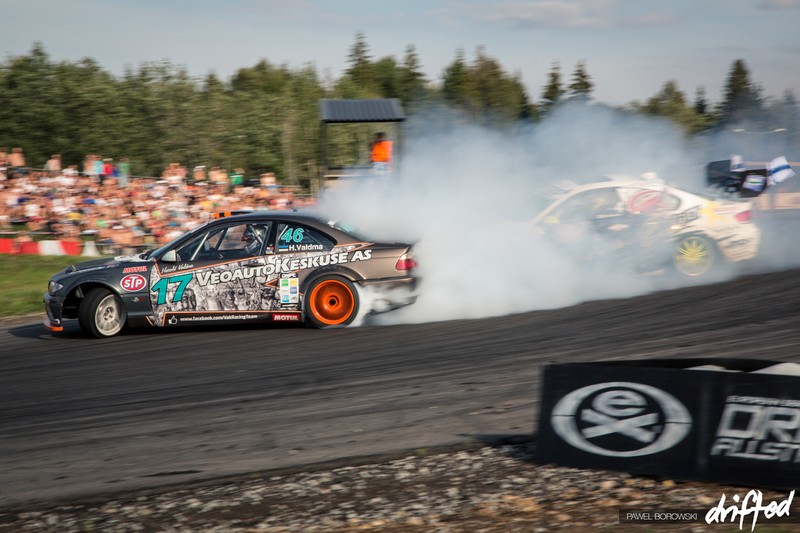 Another battle of the day was Janis Eglite VS Ryan Tuerck .Tuerck would get the advantage and win sending him into his very first European final. 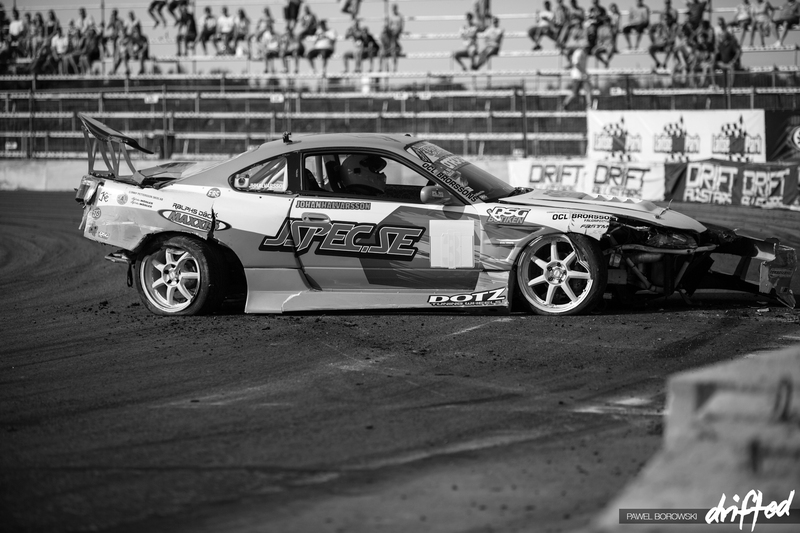 A hard fought final between Ryan Tuerck and Harold Valdma. Tuerck was given the slight advantage with such a good chase run against Valdma. At times your couldn’t see daylight between the two cars. Janis Eglite happy to get back on the podium and get some points on the table after taking second place at the season opener in London. 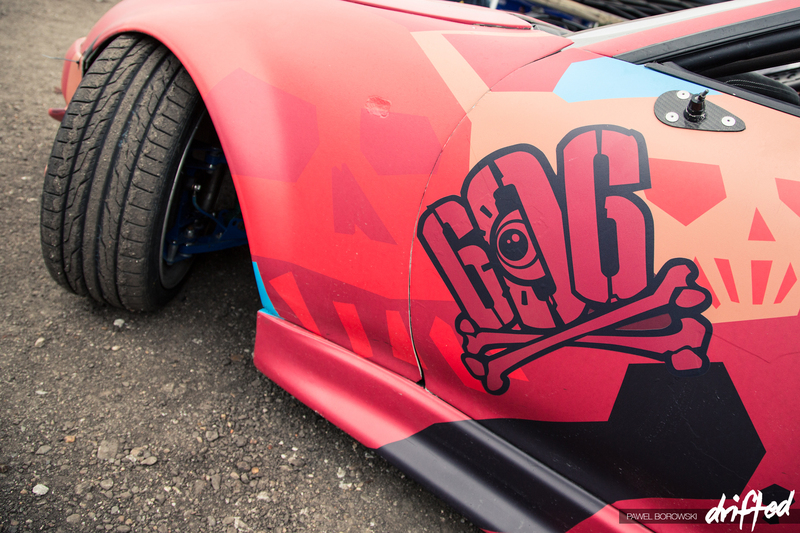 Ryan Tuerck lost for words. 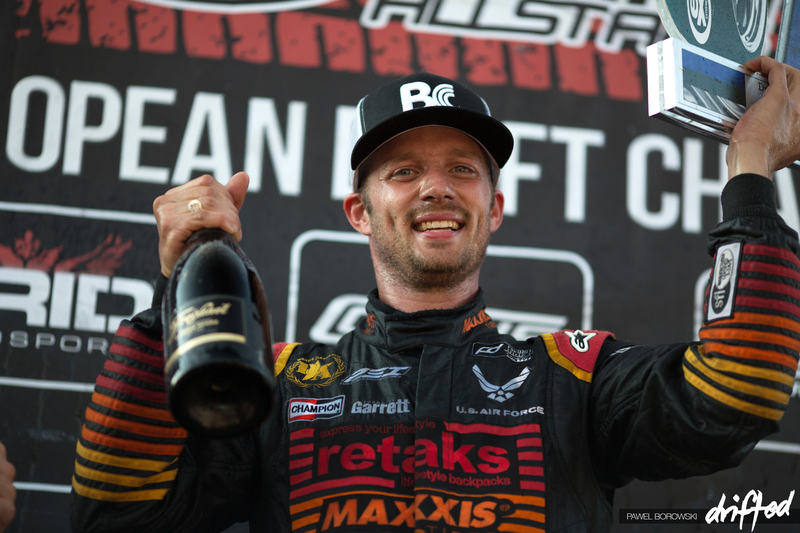 His first win since Formula Drift Irwindale back in 2009 when he nearly won the championship. 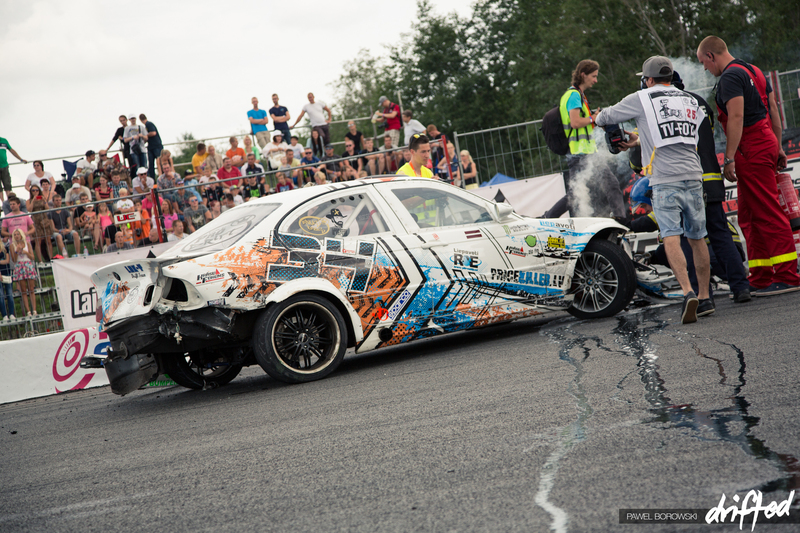 Ardo Kalda, owner of Wisefab and part time events organiser put his heart into this event with his partner Aivo Halanurm and these two Estonians pulled it off by bringing the Drift Allstars European series to Estonia. 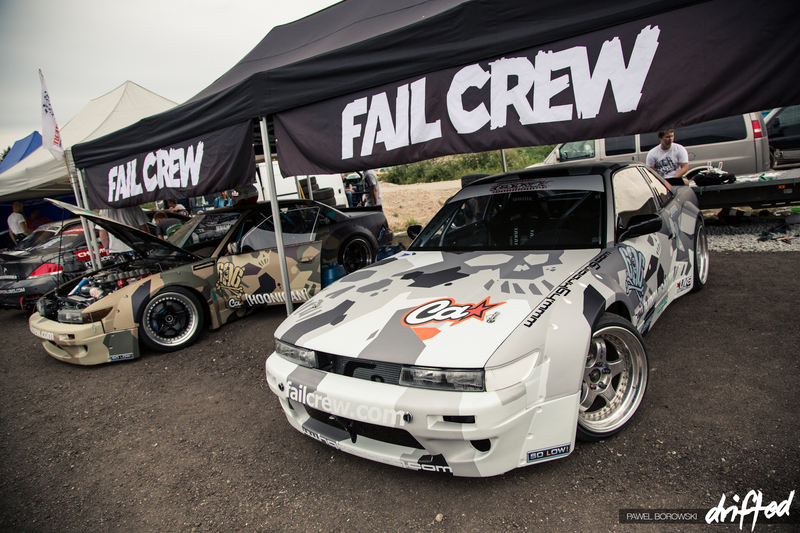 Fail Crew family – the Crazy Russians Max and Felix showing their love for there new brother in the Fail Crew army. 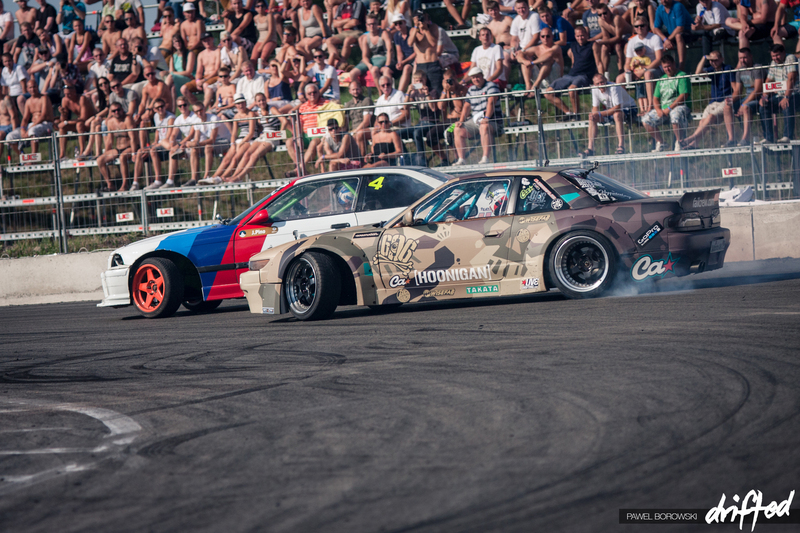 Ryan Tuerck takes the win at Drift Allstars Europe round five, the Estonian Drift GP. 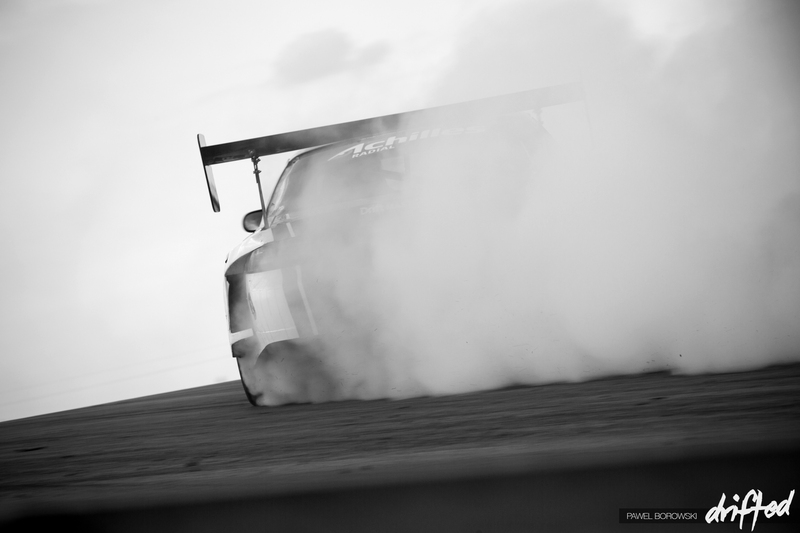 Victory burnouts for the man of the moment Ryan Tuerck!